1656 was a bleak year in the history of the bleak. For it was then, in Paris, that Francois Jaquin successfully extracted crystalline guanine from the fish’s scales. 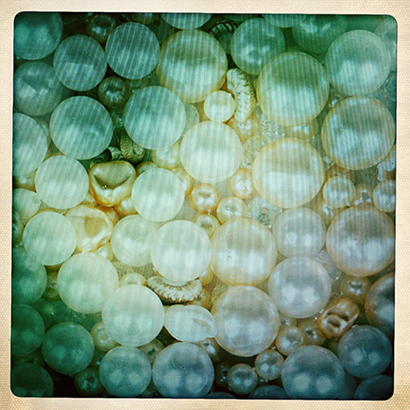 Known to many in the cosmetics industry as ‘pearl essence’, this substance was wisely used in the manufacture of imitation pearls, and suddenly, the bleak, who up until then swam largely unmolested, found itself in high demand. Of course, the bleak is not the only fish to be exploited for reasons other than its edibility. The cod, a fish very popular for its taste, has a liver rich in omega-3, while the sea-horse is used in traditional Chinese Medicine. Isinglass is a substance extracted from the swim bladder of fish (often sturgeon) which is then used to clarify beer and wine. The swim bladder has another use too. When mixed with the bones and skin and gently boiled it can form a glue, while fish remains can also be used to make fertilizer. Another by-product becoming increasingly popular is fish leather. Salmon skin can be used to make shoes and clothing, and fortunately, when tanned, it is completely odourless.